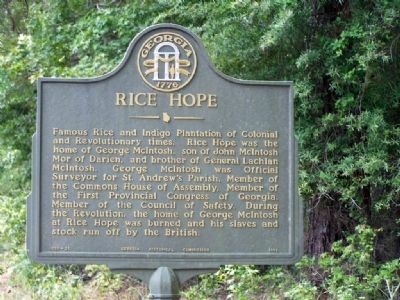 Famous Rice and Indigo Plantation of Colonial and Revolutionary times, Rice Hope was the home of George McIntosh, son of John McIntosh Mor of Darien, and brother of General Lachlan McIntosh. George McIntosh was Official Surveyor for St. Andrew`s Parish, Member of the Commons House of Assembly, Member of the First Provincial Congress of Georgia, Member of the Council of Safety. During the Revolution, the home of George McIntosh at Rice Hope was burned and his slaves and stock run off by the British. Location. 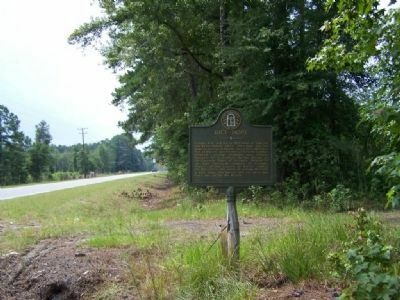 31° 33.141′ N, 81° 25.335′ W. Marker is in Eulonia, Georgia, in McIntosh County. Marker is on Ocean Highway (U.S. 17), on the right when traveling south. Touch for map. Between Pine Harbor and Fair Hope Roads. 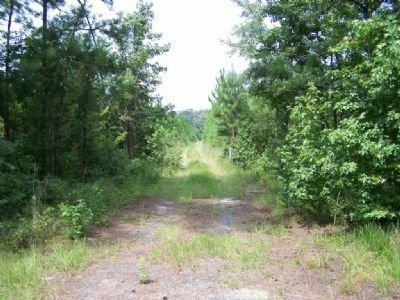 Marker is in this post office area: Crescent GA 31304, United States of America. Touch for directions. this marker); Old Court House at Sapelo Bridge (approx. 1.2 miles away); Colonel John McIntosh (approx. 2.7 miles away); Captain William McIntosh (approx. 2.7 miles away); Mallow Plantation (approx. 2.9 miles away); Old Belleville or Troup Cemetery (approx. 3.7 miles away); Capture of 23 Old Men in 1864 (was approx. 4.4 miles away but has been reported missing. ); Baisden's Bluff Academy (approx. 4.4 miles away). Touch for a list and map of all markers in Eulonia. More. Search the internet for Rice Hope. Credits. This page was last revised on June 16, 2016. This page originally submitted on September 7, 2008, by Mike Stroud of Bluffton, South Carolina. This page has been viewed 1,438 times since then and 29 times this year. Photos: 1, 2, 3. submitted on September 7, 2008, by Mike Stroud of Bluffton, South Carolina. • Kevin W. was the editor who published this page.